Slightly misleading. The green and blue histological staining that has become the EuroEPINOMICS logo features a human hippocampus, a part of the human brain that is particularly important in human epilepsy. Temporal Lobe Epilepsy (TLE) is the most common epilepsy in adults and involves the hippocampal region. Ironically, TLE is the human epilepsy that has always been at odds with genetic research. Let’s review what we know about the genetics of TLE and “hippocampal genetics”. Hippocampocentricity. When we returned from Strassbourg last year with the first EuroEPINOMICS leaflets, things became clear to us on the flight back: there is a hippocampus on it. The reason why we felt ambiguous about this is easily explained. The hippocampus is usually the focus of adult epileptology with a focus on epilepsy surgery. This is the polar opposite of pediatric epileptology with a focus on genetics. The hippocampus is a symbol of epilepsy research, but was it the right symbol for us? There is probably little hippocampus involved in the rare epilepsies and epileptic encephalopathies we are dealing with. Either way, the decision was made. Now, more than one year later, I have gotten used to it and do not want to miss it. 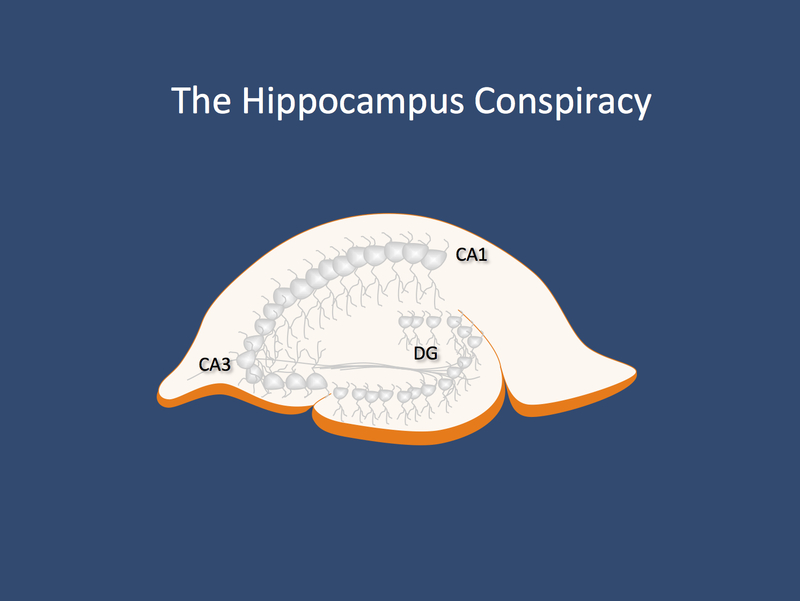 I actually vetoed an attempt earlier this year to remove the hippocampus from the blog’s home page. Temporal Lobe Epilepsy. TLE is the most common epilepsy in adults. In particular TLE with mesial temporal sclerosis (MTS) has a very good outcome after epilepsy surgery. Up to 2/3 of patients with TLE and MTS are seizure-free after epilepsy surgery, where the affected temporal lobe or the hippocampus is removed. MTS is basically a scarring of the hippocampus with neuronal cell loss. There is some evidence that prolonged febrile seizures in childhood might contribute to MTS, but there are also many cases with MTS without this. There is some evidence from families that MTS has separate genetic risk factors. Adding the prefix ‘mesial’ implies that the temporal lobe epilepsy originates from the hippocampus. A cross section of the human hippocampus and the main histological landmarks. The hippocampus is involved in learning and is one of the most vulnerable parts of the brain regarding prolonged epileptic seizures. CA1 and CA3 are a reference to an old description of the hippocampus, the Cornu Ammonis or horn of Ammon. The genetic angle. The genetics of TLE is difficult to approach as we are not dealing with a homogeneous entity. In patients with mild idiopathic mesial temporal lobe epilepsy (mTLE), twin and family studies strongly implicate genetic factors. Idiopathic mTLE basically means that neuroimaging does not identify any abnormality in these patients. A gene for idiopathic, non-lesional mTLE is not yet known, but larger families have been described that would lend themselves to gene identification using high-throughput genetic technologies. Genes that are known to result in mTLE with or without MTS are SCN1B in GEFS+ families and, as a feature of a more complex phenotype, VPS13A in choreoacanthocytosis. In contrast to mesial TLE, the genetics of the much less frequent lateral temporal lobe epilepsy is better explained. Many families are found to have mutations in the LGI1 gene, even though mutations in this gene are rare in sporadic cases. In contrast to the generalized epilepsies, focal epilepsies can be caused by acquired lesions, malformations or tumors, which makes the analysis on the genetic level difficult. When TLE meets RES. Seemingly monogenic families have been described with TLE, mainly with dominant inheritance. While the focus of the first year of EuroEPINOMICS-RES was on trio sequencing, we aim to put a stronger focus on familial epilepsies for the second year involving the working groups for autosomal dominant and recessive epilepsies. This entry was posted in 2012, basic science, Brain malformations, EuroEPINOMICS, Familial epilepsies, Ideas and tagged CA1, CA3, dentate gyrus, epilepsy research, genetic risk factors, hippocampus, SCN1B, Temporal Lobe Epilepsy, VPS13A. Bookmark the permalink. I appreciate that you still are in favour of our logo, acutally a staining that came from my lab. To avoid misunderstanding I have to emphasize that it shows a mouse hippocampus, not human (double staining for Nissl and Kir4.1). In our EuroEPINOMICS project on glia, the hippocamus of course takes center stage. Thank you for the comment, I wasn’t actually aware that this is mouse and not human (is there any way to tell this?). Kir 4.1 is KCNJ10, an epilepsy gene with its own, interesting story… Looking forward to writing a post on EpiGlia soon.